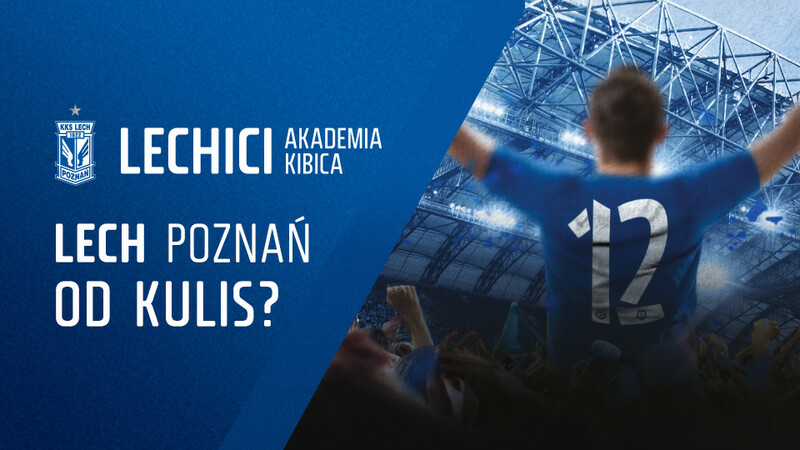 Bought a ticket to Lech's match, but you don't know how to get to INEA Stadium? Below you will find all the directions necessary to get to the stadium on time. INEA Stadium is 4 km away from the center. The easiest way to take is to turn into Grunwaldzka street and travel straight. When you reach the crossroad with Bułgarska street, turn right. The A2 highway is 8 km away from INEA Stadium. Use "Komorniki" exit and drive in the direction of the center (Głogowska street). After 5,5 km turn left into Ściegiennego street which later turns into Jugosłowiańska street. Go straight, pass the crossroad with Grunwaldzka street and you will see the stadium on the left. The airport is 4,5 km away from INEA Stadium. In order to get to the match, turn left into Bukowska street and drive in the direction of the center for 2,7 km. On the crossroad with Bułgarska street turn right and travel straight for 1,8 km. You will see the stadium on your right. In order to get to the stadium by taxi, ask the driver to take you to INEA Stadium which is located at 17 Bułgarska Street. Tram lines 1, 6, 13 and 15, as well as bus lines no. 45, 50, 63, 91 and 240 stop near INEA Stadium (stop called INEA Stadium). You can find a timetable here>>> It takes about 15 minutes to get to the stadium from the Train Station (PKP Dworzec) using tram line no. 6. In order to get to INEA Stadium from the airport, use the bus line no. 59 (in the direction of Rondo Kaponiera) and switch the bus to line no. 91 at the stop named Swoboda (in the direction of Osiedle Kopernika). There is also a possibility to use bus line "L" from the airport (in the direction of Dworzec Główny (Train Station)) and switch to line no. 63 at the stop named Szpitalna. In order to make the fans' travel to and from the stadium easier, Poznań public transport (ZTM Poznań) provides additional buses and trams in the region of INEA Stadium on the Match Day. A match ticket does not authorize to use the ZTM Poznań public transport for free. Any passenger travelling with the public transport is obliged to own a valid ticket. 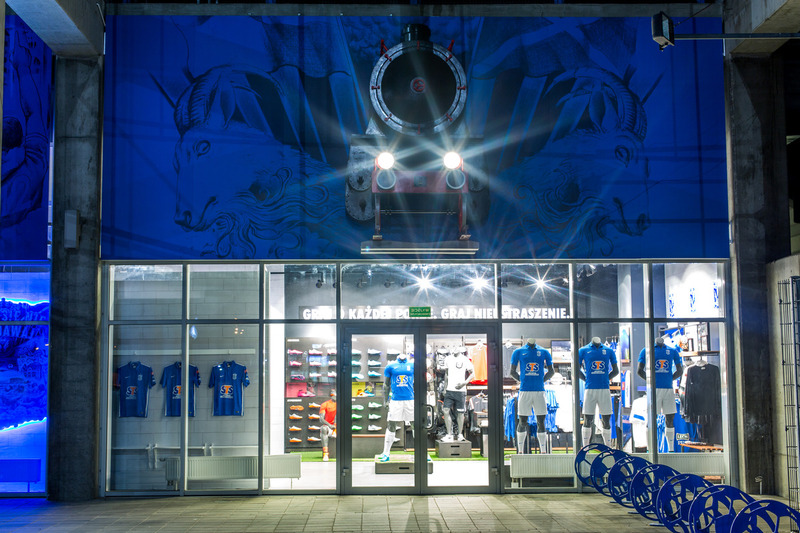 Lech's Official Store is located at INEA Stadium near E.Białas Stand. On Match Days the store is opened 3 hours before the game and is closed as the match begins. To buy a souvenir or an official jersey, please visit the store. There are 3 cashes at INEA Stadium where you can buy a ticket for a match. The cashes are open Monday – Friday from 9 am to 5 pm and on Saturdays between 10 am and 2 pm. On Match Days the cashes are open until the end of the first half. All other days than Match Days, only cashes no. 2 are open. On Match Days there is a possibility to park your car in the parking lots located at Ptasia street. There are 800 parking places available for the fans. 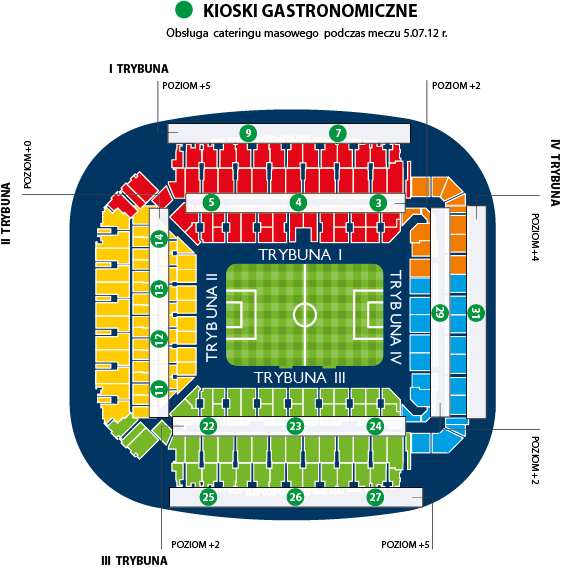 You can purchase you parking place before the match using the website bilety.lechpoznan.pl or buy a parking entry card in the cashes. A parking ticket costs 10 zł. There are also bike stands located near the INEA Stadium Sport Zone (Ptasia street) available for all fans travelling by bike. In order to get familiar with the rules that are in force on the stadium, click here.